Developing and Administering a Child Care and Education Program 9 Edition Emphasizing the director's responsibility as a leader of both people and programs in diverse communities, DEVELOPING AND ADMINISTERING A CHILD CARE AND EDUCATION PROGRAM, Ninth Edition, covers the business and interpersonal skills child development professionals need to implement an effective program for young children and their families. It is written primarily for future early childhood educators whether or not they plan to work in the administrative aspects of the field, and is also a rich resource for practicing directors. 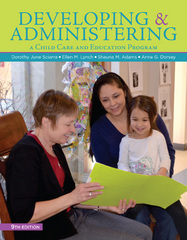 In this thoroughly updated edition, the authors provide practical information on all aspects of directing a program, including curriculum selection; funding; budgeting; selecting, training, and supervising staff; housing the program and purchasing equipment; working with children and parents; accrediting and licensing an early childhood center; and carrying out program evaluation and quality improvement strategies.